All UK employers must enrol their workforce in a workplace pension scheme by their ‘staging date’. It is important that you start to prepare now for Auto-Enrolment so that you can control costs and minimise disruption to your business. 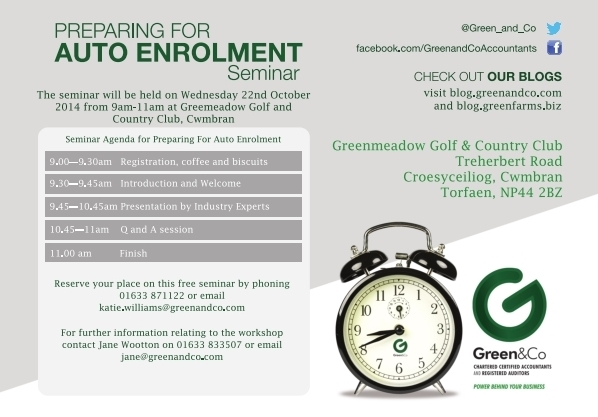 We would like to invite you to a free Auto-Enrolment Seminar to be held on Wednesday 22nd October from 9-11am at Greenmeadow Golf and Country Club. What is Auto-Enrolment and why is it being introduced? When will Auto-Enrolment be introduced and who will it affect? How does it differ from current processes? The 7 steps of Auto-Enrolment including what you need to do now. If you would like to book a place on this free seminar, please contact the office on 01633 871122 or email katie.williams@greenandco.com. Previous Previous post: Looking To Construct Or Extend Your Farm Building? Next Next post: Want To Achieve Your Business Goals? Communicate!